Eating is an integral part of life and with this includes daily dishwashing chores. And the only way to get those dishes organized is by using the best dish drying rack that suits your needs. For sure, you will truly appreciate the importance of this simple and yet useful tool once you choose the perfect one for you. We’ve searched the internet for the best dish drying rack on the market today and came up with 5 product reviews that you should definitely look into. We also included a guide on how to choose the best one for you. Once you get through our guide, it won’t be difficult to purchase that winning product. ﻿What is A Dish Drying Rack? It has a unique and innovative drainage system with its spouted drip tray pointed toward the sink. It helps excess water to flow into the sink and not on the countertop. The spout swivels and pivots so you can direct it appropriately, plus the drip tray is extendable. The rack has a beautiful finish that resists fingerprints and smudges to keep the stainless steel clean and shiny. Other than that, it features an anti-residue coating that prevents the buildup of soap and suds residue. This dish rack measures 20.2” W x 21.8” D x 14.3” H inches has divisions for a plate rack, utensil holder, and glass holders. Another excellent feature that makes this perfect for modern kitchens is the extra-large wine glass holder that is undoubtedly appealing to wine lovers. Overall, we’d recommend this as the best dish drainer for countertop because it has a swivel spout and an extendable drip tray. All its features are very compact and not bulky which makes it an ideal dish drying rack in a home with limited space. This small dish drainer by Neat-O is a compact product but with a much simpler design and style. It is also comparable to the Kitchenaid Three-piece Dish Rack stainless steel divider. The only downside we find here is that this doesn’t have a drip tray to catch the excess water. 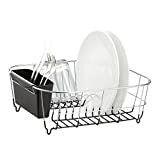 This dish drying rack measures 12.8” W x 14.2” D x 5.2” H inches has a chrome finish that provides elegance functionality. This means that it can resist corrosion, clean easily, and be sturdier. However, it can be vulnerable to rust if it loses plating due to natural wear or accidental damage. The wire base is color-coated with black to increase style and elegance, and to protect the plates from scratches. This is an over the sink drying shelf that can hold approximately 8 dishes. It has a detachable plastic cutlery holder so that you can clean it properly and make space for more plates. This is considerably a small dish rack that is designed to fit perfectly on the kitchen sink counter or inside the sink, and that is where the excess water will drain. Despite lacking a drip tray or a drain board, this product serves its function well and is also perfect for small homes with minimal dishes. It’s best to combine this with the best dish drying mat to absorb all the excess water even on the countertop. With its affordable price, you get what you pay for. The PremiumRacks Professional Dish Rack is another handy plate rack made of high-quality and has a good design. At first look, it seems similar to the Polder KTH-615 Advantage dish rack, but this seems like a better option because it’s entirely customizable and has more allowable space for your dishes. It includes 2 differently styled drainboards, a microfiber mat, 3 separate attachable cup holders, and a cutting board attachment. The product comes with a top shelf that can be flipped from side to side, front to back, or removed altogether depending on your preference. 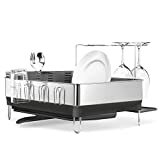 The dish rack measures 17.5" W x 13.9" D x 11" H inches is made of high-quality, food grade 304 stainless steel that can resist and withstand corrosion from most oxidizing acids. The product passed a 24-hour salt test spray, so you are safely drying your dishes on a very sturdy and durable dish rack. It is effortless to sanitize and clean, which makes it very ideal for kitchen use. Because of its high quality, this dish rack is very stable, unlike other wobbly top shelf dish racks that break easily. Despite being fully movable and customizable, it has sturdy parts that are stable enough to hold all your dishes and utensils. Overall, we like this dish drying rack because of its excellent functionality and options, so we can say that this is the best dish drying rack that you can buy. Other than that, it’s made of exceptional quality that is sure to last through years of use. The OXO Good Grips Convertible Foldaway Dish Rack is another dish dryer with a simple and functional design. At first look, it has a white color that makes it look neat and tidy. It has enough room for plates, glasses, cups, and utensils. The plate rack can fold down to make even more space for large bowls and cookware. The product measures 20.2” W x 13” D x 4.1” H inches includes enough divided utensil holders that can be removed for easier unloading and cleaning. It also has a generous capacity to keep your utensils dry after washing even the long spatula. The rack has an easy foldaway feature so you can pack it away when not in use and it doesn’t require much space. The legs can fold out to elevate the dish rack and you can also fold it in if you want it lower. It has a spout which you can open to drain the water out and close when you’re done. This plastic dish rack is very light and versatile because of its material and you can use it to keep dried dishes in the cabinet. The frame is sturdy enough to keep all the delicate dishware safe. 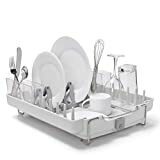 Overall, we like how neat this dish rack looks like because of its light color, different from most dish racks that are mostly stainless steel and black. Also, the foldaway feature makes it easy to pack away and store. Minimizing mess and maximizing organization. The Bamboo Dish Rack by Bambüsi is a natural option and is a great over the sink drying shelf for your plates, cups, and utensils. It is made of 100% handcrafted natural premium bamboo which is a renewable resource and a great alternative to plastic. Bamboo is known for its strength, sturdiness, and odor resistant, antibacterial properties, which makes it a safe option for food items like dishes. It’s a great material that can last for years while keeping its high-quality material. The natural bamboo material also doesn’t easily stain and lost its quality despite being in constant contact with soap, water, or food. But to preserve it more, you can add an oil finish to it too. The only downside to this rack is that you also need a d﻿﻿﻿ryi﻿﻿ng mat(no follow) to absorb the water because it doesn’t have a drip tray. This product features and X-shape design that merely folds flat when you need to clear your countertop and store it. It’s very convenient to use and adds a more natural look to your kitchen. Bambüsi offers a lifetime guarantee for a replacement or a refund, so you are assured that what you are buying is worth the price. 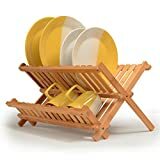 Although this is a standard dish rack, it’s still a fantastic option for your kitchen because it is lightweight, has a beautiful natural color, and has enough space for your dishes to dry. What is A Dish Drying Rack? Since dishwashing is something done daily, every kitchen should have a dish drying rack to dry and store dishes and cookware. A dish drying rack is convenient not only for the plates but also for cups, utensils, glasses, pots and pans. Over the years, dish racks have evolved and become a necessity in the kitchen. Which is why despite its simplicity, there are still features to look for. With this simple tool, organizing your dishes and keeping them dry and odorless is very easy. How to Choose A Good Dish Drying Rack? Is the dish drying rack easy to assemble? Remember that you have to clean it once in a while, so you have to disassemble it to wash and reassemble it back again easily. When you take it out of the box and assemble it, you’d like to know if the dish rack feels stable. Stability is necessary since it will hold heavy plates and utensils that might be fragile and break if the dish rack falls. Like we said earlier, it’s necessary to clean your dish rack once in a while. If you don’t, it can cause molds and mildew to build up at the bottom where the drip tray is. A stainless steel dish drying rack usually cleans easily and doesn’t cause rust. Other than that, it should clean up well when washed with soap, without the need for abrasive cleaning agents. Considering the size is very important and can help so much in organizing your dishes. How many are you in your home and how many dishes are you going to dry on the rack? If you live alone, then a small dish rack should be enough. But if you have a family and often cook at home, then an extra large dish drying rack will fit better. Using the best dish drying rack in your home can help you a lot in organizing your kitchen. Even though it seems like a very simple and often overlooked tool, it has a lot of functions and features that can help you dry or store your plates, cups, glasses, cutleries, and cookware. 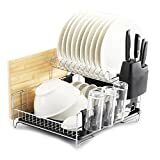 Although we like all of the drying racks that we reviewed, the best dish drying rack for us is the PremiumRacks Professional Dish Rack because it is fully customizable giving you more options depending on your preferences. It gives you more freedom in choosing what kind of style you want your rack to be.